SUMMARY: When she finds a enchanted piece of a centuries-old rapier, Jill, a competitive fencer, must learn to survive when she is transported back more than 200 years to a pirate ship. 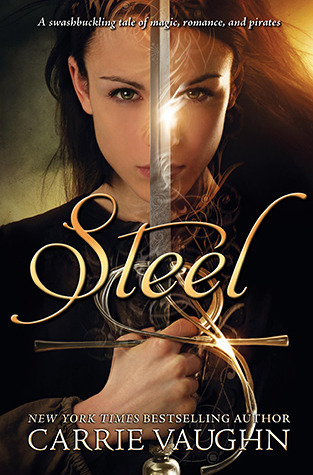 WHAT I LIKED: With a interesting premise and a gorgeous front cover, Steel has the potential to be an exciting, swashbuckling action-romance. The action begins quickly; Jill is on the pirate ship within the first 30 pages. The clean, no loose-ends epilogue ends the story equally quickly and is not drawn out or overlong. The lack of medicine in the 18th Century will help readers see why people died so young at that time. After a battle, a man's arm must be amputated (sans anesthesia or antiseptic), with only a bottle of rum to dull the pain. When her own arm needs stitches, Jill worries when the surgeon stitches her wound without disinfectant and "with a needle that didn't seem sharp enough and thread that felt like it should have been used to mend sails" (152). With many issues plaguing today's health care system, it is eye-opening to think about just how far we have come. The conditions on the slave ship are also appalling. Jill describes "the smell of illness, of people living packed together without washing, without clean water, without anything" (77). Realistic descriptions enable young readers, many of whose sole knowledge of slavery is their unread history textbooks, to witness the deplorable treatment of African slaves. WHAT I DIDN'T LIKE: Liking Jill isn't easy. She interminably whines about losing her fencing match; it seems she's never heard the phrase "You win some; you lose some." Get over yourself, girl. Once she is transported to the pirate ship, Jill starts to learn how easy her own life truly is, a fact readers are constantly reminded of. The romance between Jill and Henry takes too long to get started but when it finally happens, it seems abrupt. Why does Jill kiss him out of the blue? Further, after Jill's near-death experience, Henry tells her, "You could have been killed, Jill. Then what would I have done?" (274). Let the eye-rolling commence! This seems a bit melodramatic considering Henry is a PIRATE who has known Jill for all of a couple of days. Despite lots of action sequences, the slow-paced plot put me to sleep a couple of times. I was never "sucked in" or breathlessly awaiting the next page, just kind of bored and ready to move on the next book on my shelf. THE BOTTOM LINE: Just okay. L.A. Meyer's Jacky Faber series is a much better choice for adventure stories featuring girl pirates. STATUS IN MY LIBRARY: We have it. Though I do not really talk it up, it does get some checkout. The cover is gorgeous, and the summary makes it sound better than it is. Great review. Sorry you really didn't care for it though.